Most marketing and innovation teams today care deeply about capturing the customer journey – whether they think in terms of competitive analysis, customer experience, path to purchase or product testing. Understanding the customer journey—including the context behind their decisions—helps companies improve their success in many areas including entering new markets, identifying new product innovations, updating brand positioning, identifying retail opportunities, improving customer or user experiences and even responding to competition or market changes. In today’s fast-paced world, what is the best way to increase your understanding of the customer journey? In this post, we examine specific ways to capture in-depth experiences including attitudes, behaviors and context for decision making. Historically, capturing the customer journey has been time-consuming and expensive. Today, there are a variety of online approaches that capture better customer journey information, faster. The leading online approaches include a mix of online diaries, photo & video sharing, survey stories, whiteboarding and group discussion to better understand the context and “why’s” behind the customer journey. When evaluating new online research solutions, make sure they are effective at understanding the customer journey and summarizing results, so you can and deliver better products and services as a result. In our previous post, we explored Seven Ways Customer Journey Research can Transform Your Business. Clearly the more you know about your customers’ path to purchase, usage experience or website experience, the easier it will be for you to optimize them, delivering exemplary customer experiences along the way. Sounds great, doesn’t it? But how exactly can you measure the path to purchase and experiences in an efficient and affordable way? For decades, companies wishing to research the customer journey would collect observational data and extrapolate from there. Researchers, for example, might set up a camera in a grocery store to observe how customers interact with specific products. Observational data is undoubtedly important. But it falls short because it doesn’t tell the whole story. Imagine a customer, who is being filmed, picks up a product, fidgets with it and ultimately puts it back on the shelf. Researchers see the behavior very clearly. But in this instance, they are unable to determine why the customer put the product back. 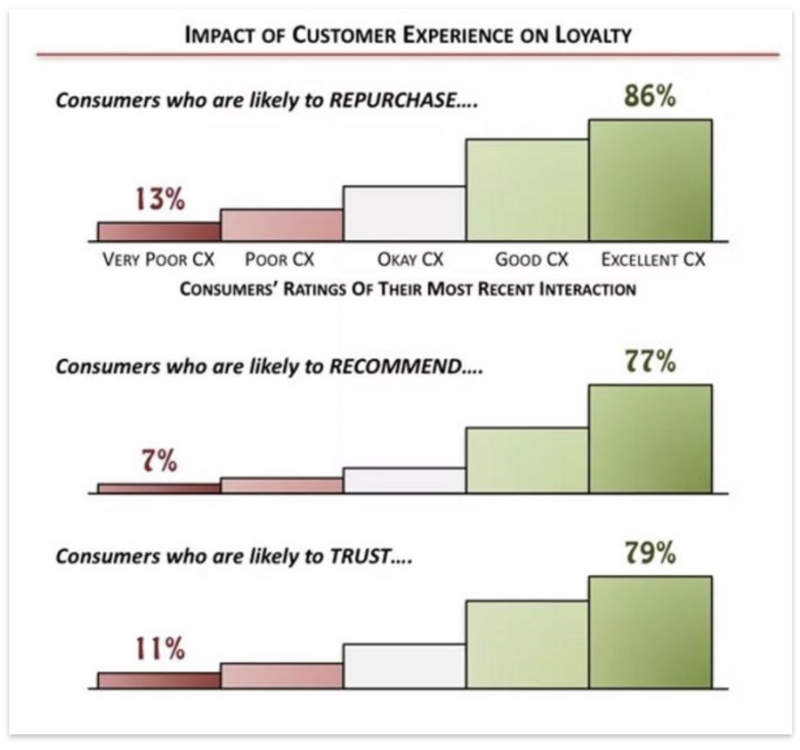 This is the critical context researchers need to truly understand what’s influencing a customer’s attitude and behavior. To this end, today’s leading researchers rely on ethnographic research to get a firmer grasp on the customer journey. Quite simply, ethnographic research combines observational data with direct engagement. A researcher might observe the customer in the grocery store, to continue the example from above, and then engage with them immediately after they’ve made a purchase decision. That way, they can understand with more certainty why customers act certain ways. In the past, ethnographic research was mostly confined to expensive in-person interviews. However, thanks to the evolution of technology, there are now modern digital solutions companies can leverage to get the data they need to make informed decisions. Not only are these innovative tools affordable, they also enable companies to quickly ask the right people the right questions at the perfect times. Thanks to new agile online research tools, it’s now faster and easier for researchers to capture the customer journey in the depth they need to innovate new solutions. Agile Consumer Insights Communities assemble qualified research participants in online groups, creating a digital experience that allows for both one-on-one observation and group discussion. Subjects can participate in research on any device from the comfort of their own homes—or even when they’re on the go. Not only is this a more efficient and cost-effective approach for everyone involved, researchers also benefit from more accurate and honest answers, as people are more likely to be honest when they are online compared to when they are sitting face-to-face with a researcher. 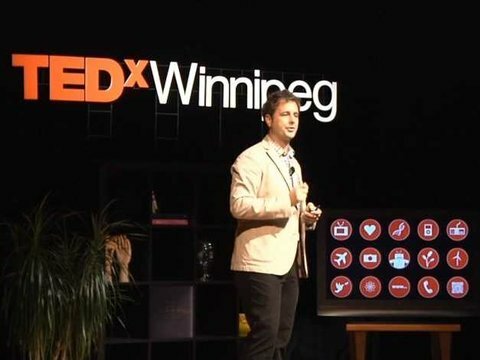 Check out the TedxTalk Digital Deceit by Jeff Hancock to learn more. Imagine you want to capture someone who is remodeling their home’s opinion on a set of blinds. Thanks to online solutions like Digsite, you can quickly assemble a group of people who fit your criteria and capture their experiences. And the best part? Because the research is conducted online, you can ask them questions while they are playing around with the set of blinds. This increases the accuracy, thoroughness and honesty of their feedback; asking research participants to recall their experiences from their memory results in fewer details at best and inaccurate information at worst. Agile platforms like Digsite provides several different ways to research the customer journey, each with their own strengths for getting deep insights and informing solutions. Online diaries. Let’s say you are trying to figure out what customers buy each week at the grocery store. Ask research participants to maintain online diaries to record this information as it happens with a mix of text, photos and video. Make sure your request is broken down into simple, easy to understand steps that are easy to capture in-the moment. Otherwise, it’s unlikely they’ll maintain their diaries to the extent you’d like. While this approach provides lots of unbiased data, it often doesn’t drive deep enough into the “why’s” behind their behavior. Photographs and videos. Ask your customers to share photographs and videos of their experiences through a conversation task. This enables you to capture the richness of the experience with a combination of text, photos and video – and capture more details with less disruption. Platforms like Digsite enable instant transcription and time stamping of videos, along with keyword tagging for easy analysis. For the best results, break the journey into a series of short videos to make the content more complete and easier to capture and analyze. Survey Stories. Often companies use open and closed survey questions to find the information on user journeys. This typically works better for recalling past behavior rather than capturing experiences as they happen. Digsite offers a newer story telling versions of survey questions that transform survey questions into a user story. This Fill-In-The Blank task allows you to string together a mix of closed ended and open ended responses to tell a story. So you can ask participants not only a series of steps, you can also capture beliefs and context along the way. Whiteboarding. Sometimes it is easier for participants to share the relationship and sequence of steps in a visual manner, rather than just with words. Digsite allows research participants to share these visual processes by commenting on whiteboarding tool that uses images to help explain their journey. 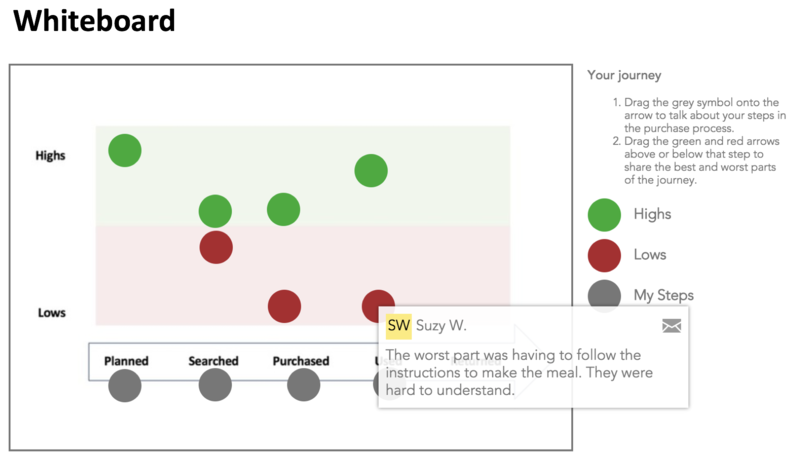 This functionality gives researchers a way to better capture and group “stages” within the customer journey, and understand which stages might be skipped depending on the user type or occasion. Group discussion. Consider mixing in one-on-one and group interactions with consumers through group discussion. This approach allows participants to share their journey first, and then read about other users’ experiences. Participants often comment on similar experiences they’ve had or how their journey differs. It can often lead to suggestions or new ideas as participants feel a part of the process of identifying problems and solutions. Voting. While you might not think of voting as part of capturing a customer journey, capturing many individual experiences in the same online group gives you unique opportunities to find common issues or problems. With Digsite’s voting task, you can ask people to share their problems or work-arounds, and then have the rest of the group vote on the areas they’ve experienced as well. This gives you a sense of magnitude among issues that not everyone may have reported initially, but has experienced. Depending on the specific issue at hand, you’ll typically find that a combination of these task types work together to get you the journey details you need. Some researchers prefer to collect all journey information in an “unmoderated” way and analyze the data later. But many are finding great benefits from a more collaborative approach where consumers share experiences privately first, and then react to others experiences and even provide feedback on potential solutions. Consider who on your team to include in observing the data collection. Often you can get much richer insights by taking the time to read results as it they collected so you can ask individuals or the group follow-up questions based on what was learned. Getting great customer journey insights doesn’t have to be hard,—and you don’t have to reinvent the wheel. Bake agile insights tools into the core of your development process to become a faster, more agile company. One important consideration in bringing customer journey research in-house. If you don’t think about the analysis before you collect customer journey feedback, you may end up overwhelmed with unstructured data that is time consuming to review and analyze. Look for agile tools that provides summary charts, uses natural language processing to tag themes for you, and allows you to feature key customer quotes in an automated summary report. Also, if you are capturing video, find a platform that auto-transcribes and timestamps the video for you, so you can easily build clip reels to share with your team. Finally, make sure you have the ability to break out the results by customer segments and create customer segments based on the results. Often capturing experiences leads to identifying new segments of customers. Being able to quickly break out segment results can be a life saver! When you’ve finished reviewing your customer journeys, consider visualizing results and identifying opportunities using a journey map. 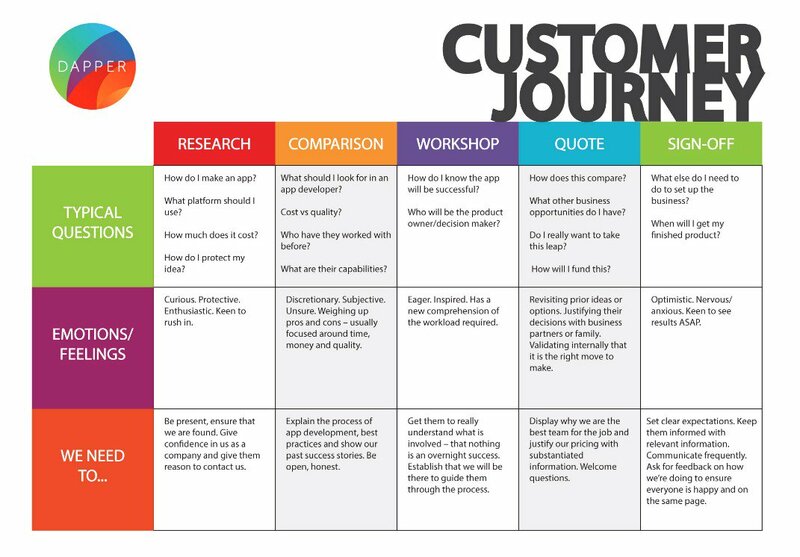 You may want to create multiple journey maps by customer segment to bring to life their unique needs. 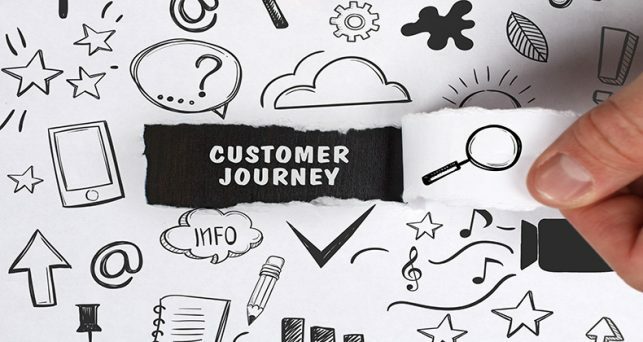 Here are some examples of customer journey maps (https://conversionxl.com/blog/customer-journey-mapping-examples/) that might give you some ideas of how to structure your results. Thanks to newer agile research tools like Digsite, you can gather the actionable customer journey information you need to make the best decisions—quickly and affordably. What’s not to like? To get started with agile research and learn about How To Buy Online Qualitative Research and Assess Providers, get our eBook now.